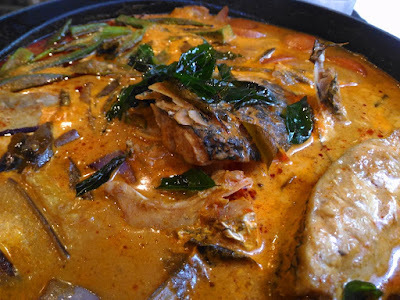 FISH HEAD CURRY is a cuisine with indian and chinese origins. 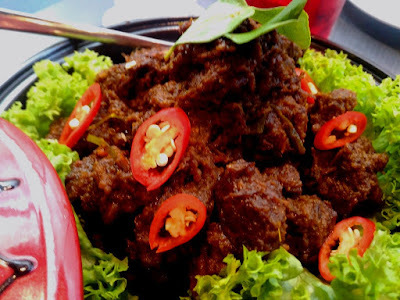 Generally it's not categorized under 'cheap fare' dish among those who loves these curry. 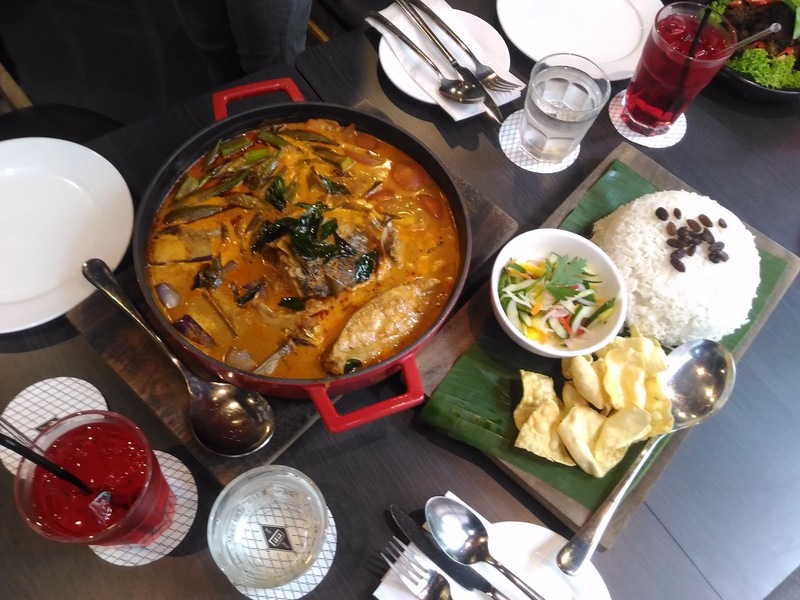 Cooked with ingredients such as Tamarind Juice, Coconut Milk, Curry Spices, Vegetables such as Okra and Eggplants, and not forgetting the main ingredients the Head of the Red Snapper. The dish can be taken with rice or bread, or just sipping the gravy itself. THE KL JOURNAL HOTEL, Bukit Bintang, Kuala Lumpur is serving their 'KILLER FISH HEAD CURRY' set for lunch and dinner. 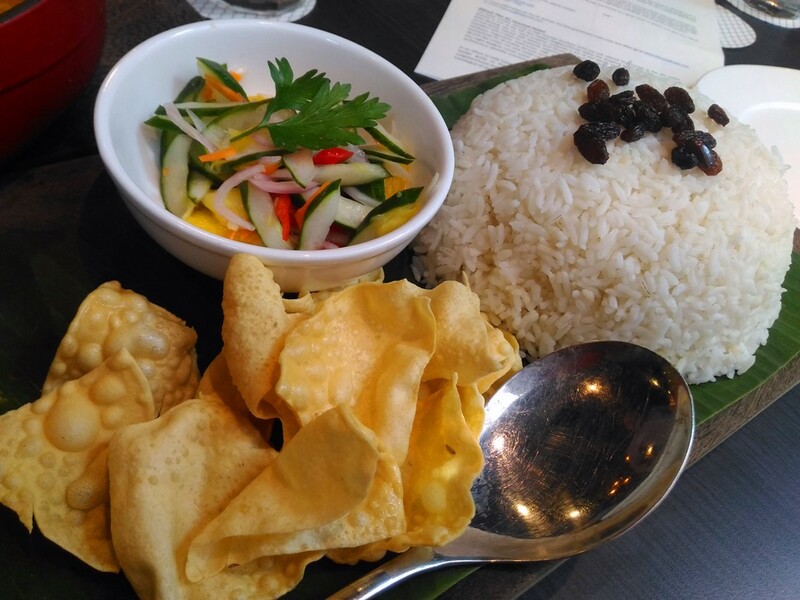 Prepared by Chef Heng, priced at RM50.00 nett per set, served with Rice, Picked Vegetable (Acar Jelatah) and Papadom and all these is served for 4 persons. Yes, confirmed it's RM 50.00 for 4 persons. What is different about these FISH HEAD CURRY? It's like the others that you find. It's aroma is already beautiful to our smell perks, the taste of the curry is not overwhelming with spices (that it will drown the fresh taste of the fish and vegetables). And just slurping the gravy up like a soup is possible. The red snapper and the vegetable is of fresh picked by the Chef himself. For bookings and information, give them a call at +6016-211 7053, or can Follow them on facebook.com/thekljournal or instagram.com/thekljournal. The Kuala Lumpur Journal, a new concept boutique hotel has just opened for business in the city centre. Nestled in one of the last few hidden neighbourhoods withing the shopping and entertainment enclave of Bukit Bintang, this 12 Storey property comprises a mix of 117 deluxe twin and king rooms; plus exclusive Journal Suites. Infused with distinct local flavour, The Journal appeals to a new generation of independent travellers with a taste for authentic experiences and modern amenities. All rooms feature floor-to-ceiling windows, ergonomic mattresses, high thread-count sheets, a power shower and great plugged-in connectivity for all mobile devices, wireless Bluetooth connection to a high quality audio stereo system and 40 inh flat screen TVs with HDMI cables and USB charge ports. On offer are king and twin deluxe rooms plus wight designer corner suites. All rooms feature inspiring black and white portraits of KL street life and architecture; specially commissioned by TheKLJournal. 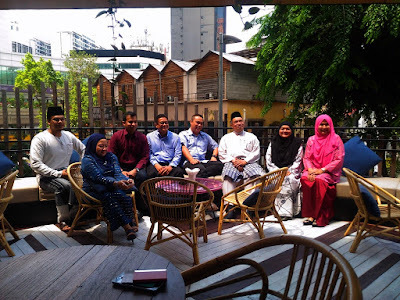 In an effort to help hotel guests discover KL in an authentic way, The KL Journal has also curated its own insider guide to the city with handpicked suggestions on how to experience the surrounding neighbourhood and KL City like a local. 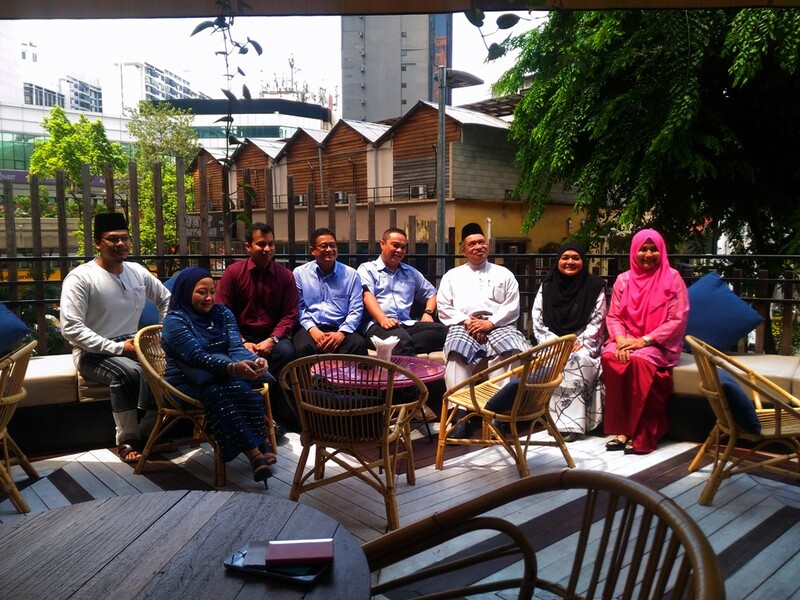 The intention is to encourage guests to create their own personal travelogues of special experiences in KL that they'll want to bookmark. Other hotel highlights include Workers' Union on Level 1, a creative communal area designed for work and play with a flexible open plan layout. Here guests can set up their mobile work stations or opt for one of the breakout meeting rooms that feature quirky graphic wall art and installation piees. Everything opens out onto a large green terrace with wather-beaten tables and comfy lounge seating for relaxed after hours conversation and to unwind as the twilight hits the city. In line with keeping things simple, the hotel has one main dining restaurant, The Kedai Kopi Journal which resonates a little of the old school coffee shop meets modern chic, features a daily breakfast spread which includes freshly baked breads and pastries churned out daily from its pastry studio and a classic menu of east meets west, focusing predominately on Asian flavours for both lunch and dinner. Other amenities include a rooftop saltwater infinity pool with a great vista of the city particularly at twilight and a small gym for hotel guests. Follow us on facebook.com/thekljournal or instagram.com/thekljournal.